This year’s Pre-departure Orientation (PDO) for grantees of the Global Undergraduate (Global UGRAD) Program brought over 100 Pakistani students to Islamabad for a chance to get better acquainted with the program, and its participants. 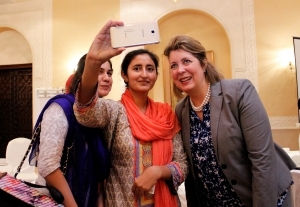 The U.S. Government-funded Global UGRAD program allows students enrolled in undergraduate programs in Pakistan to spend a semester studying at American colleges and universities. U.S. 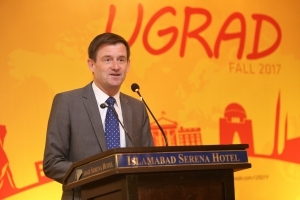 Ambassador, David Hale speaking to the grantees at the Global UGRAD PDO in Islamabad. U.S. 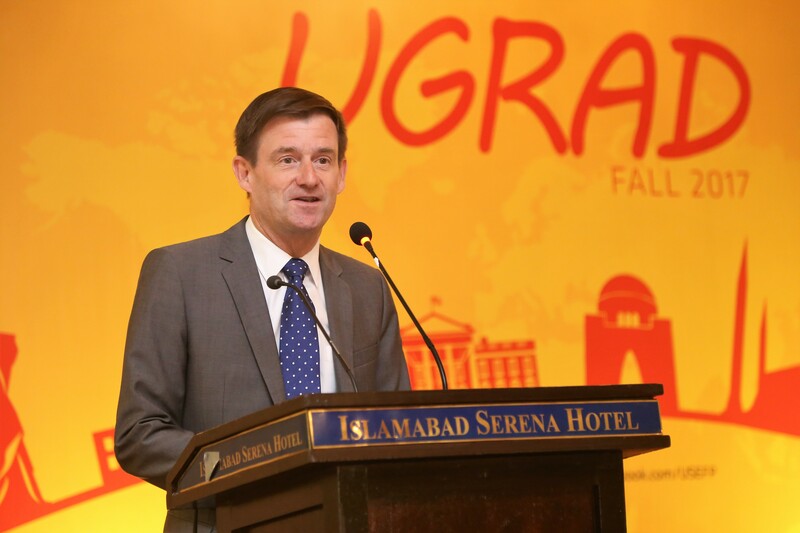 Ambassador to Pakistan, David Hale congratulated the students attending, and remarked on the importance of the exchange program. Managed by the United States Educational Foundation in Pakistan (USEFP), the Global UGRAD Program has gained immense popularity among Pakistani university going students, with approximately 1,400 Pakistani students having participated in the program since its launch in 2010. This year’s Global UGRAD participants hail from across Pakistan and represent a broad range of academic fields including engineering, business administration, and the sciences. 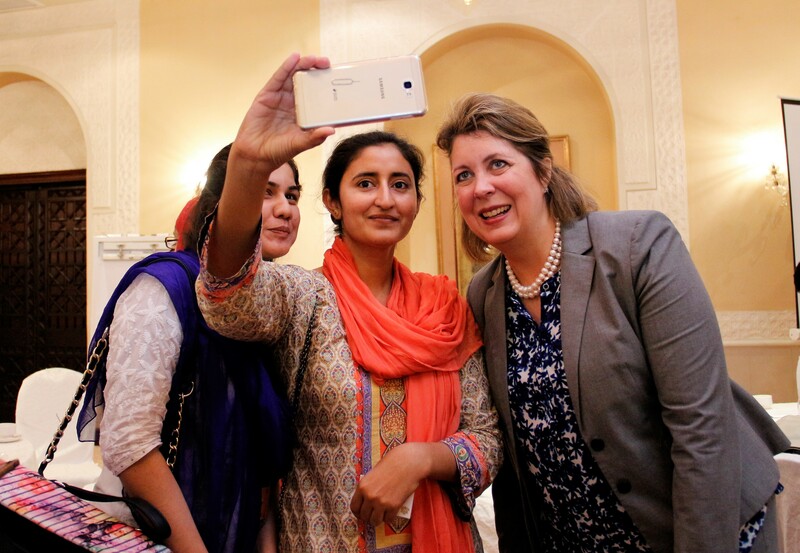 UGRAD grantees sneak in a few selfies with U.S. Minister Counselor for Public Affairs, Christina Tomlinson! Also speaking at the event, USEFP Executive Director Rita Akhtar encouraged students to take full advantage of the academic and extracurricular activities available in the U.S.
Khushal das Parmar, and Alvina Ahmad are Global UGRAD alumni who exemplify the success of the program, which provides training, leadership, and community engagement skills to a diverse group of youth leaders from underserved populations across Pakistan. Similarly, Alvina referenced to the Global UGRAD program as a unifying factor between diverse nations. “After my return, I have come to realize that what I have in common with my international friends is, faith and hope that each of our countries and its people are striving for excellence,” she said. USEFP is now accepting applications for Global UGRAD Program. To learn more about eligibility, and how to apply, visit here. Previous Post173 Pakistanis Prepare for Fulbright Studies and Research in the U.S.Next Post Pakistani Students Prepare for a Semester in the U.S.